Here's a useful, pretty favor that's guaranteed to bring smiles for years to come. 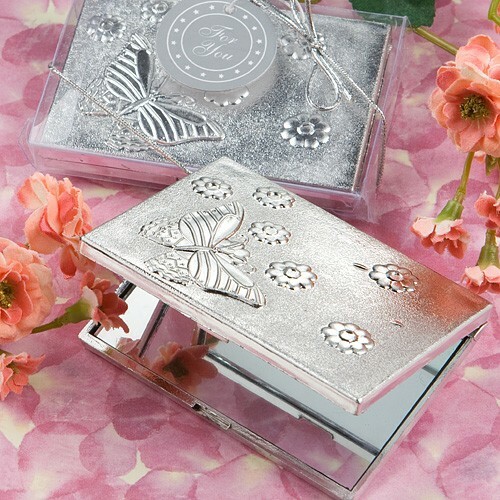 That's because your guests will reflect on your happy day every time they see their reflection in these butterfly mirror compacts. 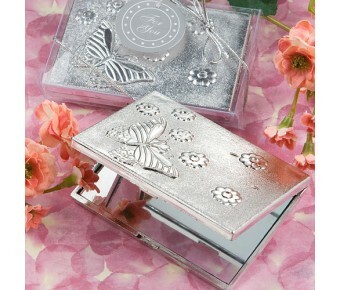 From Fashioncraft's Elegant Reflections Collection, each measures 3" x 2.25"and is made with a shiny-silver-plated color, hard molded plastic outer compact cover with detailed butterfly and flower designs on top and a hinged opening that reveals a dual-sided mirror interior. Sure to shine as a favor for all occasions, each comes in a clear acetate box, tied with a silver bow and an attached silver "For You' tag.